Companies, organziations, and faith congregations can directly impact their community by helping build a home for a family in the Midlands. There are many different sponsorship levels, and numerous construction opportunities available for each. Organizations can help by sponsoring a multi-week home build, a partial week long blitz build, a neighborhood revitalization project, or even sponsor a single volunteer day on a construction site. 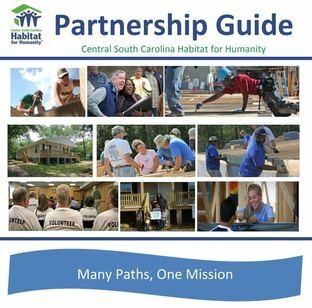 All sponsorship levels are sincerely appreciated, and our Central SC Habitat Staff can easily match your organization's giving ability with a deserving project. Check out our Partnership guide for sponsorship information.